The Vice President’s retort was made in response to the vehement public objections made by Opposition Leader, former President Bharrat Jagdeo with regards Government’s proposal to revamp the Integrity Commission by amending its governing legislation. He suggested persons could make a false declaration to the Integrity Commission and as such an investigative team should be part and parcel of the legislative revamp for the Integrity Commission. Vice President Ramjattan said there has also been at least one recommendation for a Prosecution Unit to included in the Integrity Commission. Ramjattan was at the time speaking with reporters at the Marriott Hotel on the sidelines of a workshop hosted by the Ministry of Social Cohesion. He confirmed with media operatives that the Cabinet is currently mulling over names nominated with relation to appointments to be made at the Integrity Commission in order to advise President David Granger. Jagdeo during a press conference venued at his party’s Freedom House Headquarters on Tuesday last fervently protested the proposals and suggested the Integrity Commission is yet another victim of the administration’s attempts at subverting such bodies. The former president believes the administration is also looking to place powers in the hands of the executive which could see person in public life being removed from office when he or she contravenes the code of conduct—a code the Peoples Progressive Party is yet to contribute to. 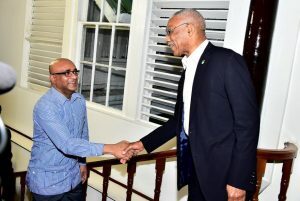 Jagdeo suggests government is only interested in a façade of transparency and accountability while at the same time dismantling institutions such as the Integrity Commission and questioned why President Granger would want that body to be imbued with expanded powers in order to enforce the proposed code of conduct for persons in public office and other types of office holders. 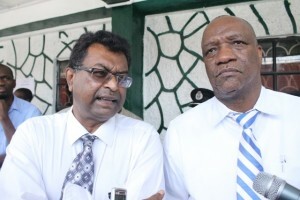 Scoffing at the proposals, Jagdeo opined that the APNU-AFC leadership should in fact already be in jail since its membership is already be in breach of the codes, “they breach this every single day, they should all be in jail by now…They are all in breach of these codes.